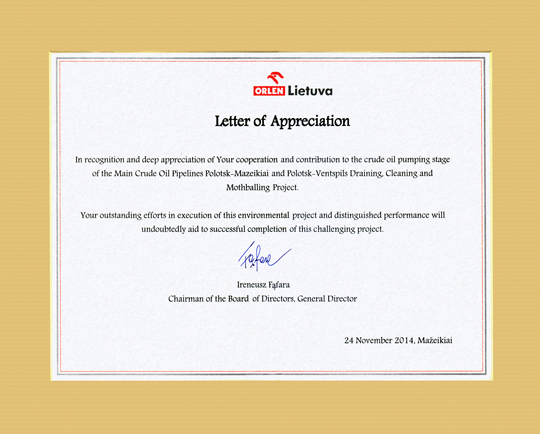 Orlen Lietuva letter of appreciation — CEPS a.s.
We appreciate the recognition that company ORLEN Lietuva expressed to us for our works on the challenging environmental project of emptying, chemical cleaning and inertization of the main crude oil pipelines in Lietuva and Latvia. In recognition and deep appreciation of Your cooperation and contribution to the crude oil pumping stage of the Main Crude Oil Pipelines Polotsk–Mažeikiai and Polotsk–Ventspils Draining, Cleaning and Mothballing Project. Your outstanding efforts in execution of this environmental project and distinguished performance will undoubtedly aid to successful completion of this challenging project.